Kiko Pop is a fun game set up on the shore of Kiko Lake by Elvin. He allows people to throw darts at balloons in the hopes of popping them. Elvin is a generous host, and will give you the option of three different difficulties of game when you visit him. 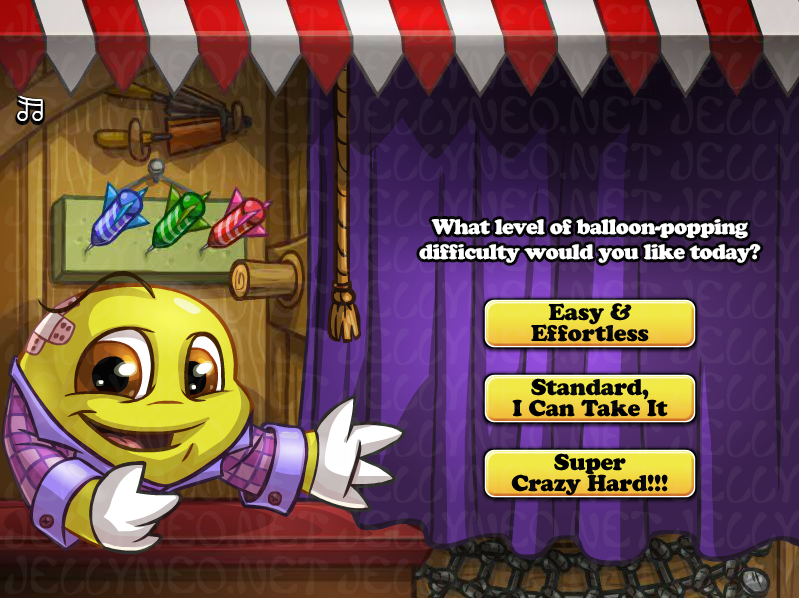 Harder difficulties will reward rarer prizes, but the balloons are also much harder to hit. Once you have chosen the difficulty, Elvin will begin spinning the board. 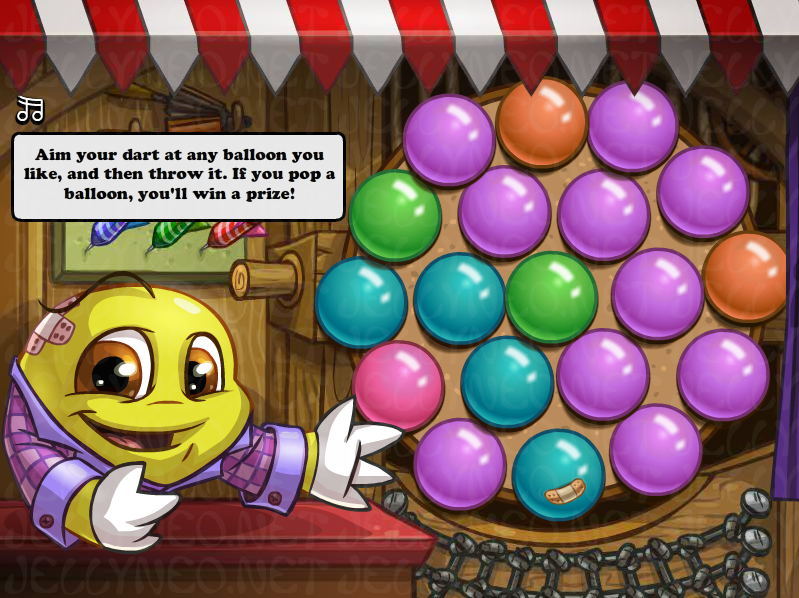 The objective is to hit and pop any of the balloons on the board by aiming and clicking with your mouse. Don't worry if you have perfect aim and still seem to miss, the game is rigged in a way similar to those in the Deserted Fairground. The appearances of the balloons and where you aim doesn't truly make a difference; whether (and what) you'll win is set as soon as you go to play. If you successfully hit and pop a balloon, you will reveal an icon of a prize. Elvin will then tell you that you have played your fair share of Kiko Pop - you may only play once per day. 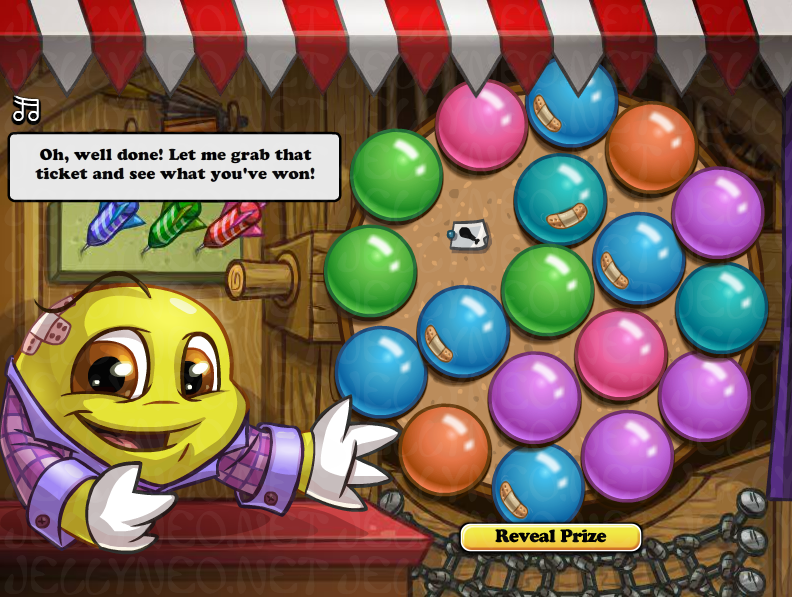 Prize possibilities range based on difficulty, and can also be determined by the icon shown when the balloon is popped. The known categories are Wearables, Books, Food, Battledome, Toys, Present (multiple item types), and the Question Mark. The Question Mark gives items normally given out by dailies, regardless of rarity, and also has the chance to give you the avatar. The Ball icon gives an item in the Toy category from rarity 50-89. The Book icon gives an item in the Book category from rarity 45-85. The Food icon gives an item in the Food category from rarity 20-89. The Clothes icon gives a clothing item from rarity 45-85. Possibilities are a Clothes item from rarity 45-85, a Gift item from rarity 45-85, a Mystical Surroundings item from rarity 65-85, or an Ugga Shinies item from rarity 65-85. The Sword icon gives an item from Battle Magic or Ice Crystal from rarity 60-89; if playing on Easy, it may instead give a Healing Potion. The Present icon gives a random item from rarity 34-89. The Question Mark icon gives items normally given out by dailies, and also has the chance to give you the avatar. An item between Rarity 60-89. You have a fairly equal chance for each rarity in the range. The Question Mark icon is available on this difficulty. An item between Rarity 70-89. The Question Mark icon is available on this difficulty. This page was last updated on April 4, 2016.